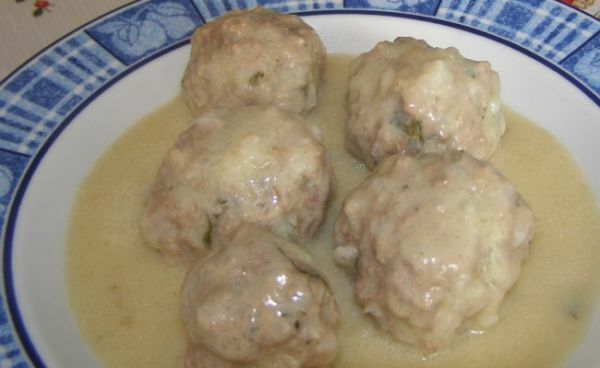 Giouvarlakia, (“γιουβαρλάκια” in Greek and “yuvarlak köfte” in Turkish) are meatballs cooked in a traditional Greek egg/lemon soup called avgolemono (“terbiye” in Turkish). The avgolemoni soup is made as below but without the meat balls ingredients/steps and ideally with chicken added to the water at the outset when boiling to give the broth a richer flavour. Our recipe for avgolemoni soup, involves using chicken for the broth, which is also served as part of the soup. 1. In a deep mixing bowl, mix the meat, chopped onion, rice, egg whites, half the parsley bunch chopped, the bunch of dill chopped, a splash of olive oil, salt, pepper and let it stand. 2. Roll each meat mixture to make small bowls and dust each with flour to stop them falling apart when cooking them later. 3. Pour around 2,500g of water into large pan, along with the stock, carrots, potatoes and remaining chopped parsley, salt, pepper, splash of olive oil and bring to the boil. 4. Reduce the heat to medium and add each giouvarlakia meatball one by one to the water mixture. 5. Reduce heat to low, cover the pan, and cook the meat balls for 30 minutes. 6. In a separate bowl, beat the x2 egg yolks and then mix in with the juice from the x2 lemons. 7. Add around x2 ladles of the meat mixture into the egg/lemon mixture and continue beating it to get a foamy yellow sauce. 8. Slowly add the egg/lemon mixture to the meat mixture (to avoid curdling) and mix in. Giouvarlakia are best served with some fresh bread, and can be a main course, or can be a soup based starter as well.